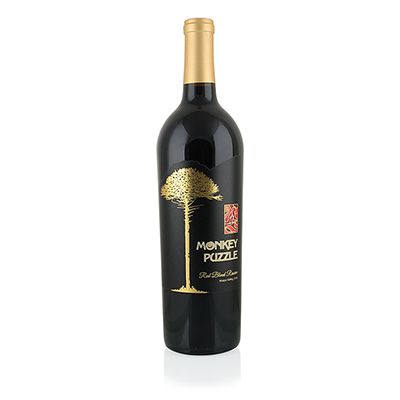 Monkey Puzzle comes to us from Bodegas Las Pircas, located in Chile's famous Maipo Valley. The winery was founded in 1998, and its owner, Elvio Olave, has over 50 years of winemaking history to draw from. Elvio came from a winemaking family, learning the entire procedure from the ground up. He tended the vines, crushed the grapes, monitored each barrel and, finally, bottled his prize. He was taught respect for the winemaking process and to treat each step - from planting to bottling - with great care. It is this type of attention to detail that accounts for the stellar wines he creates. Las Pircas is also a leader in the growing movement to protect the environment and practices those concepts at every stage of production. Where formerly chemicals were used, they now use only environmentally friendly and natural remedies. Chile is very close to the equator. It would be much too hot to grow grapes near sea level, there, which is why grapes are grown at elevations of 2,000 feet and higher - in areas like the Maipo Valley. The sun is brighter at this altitude, allowing the grapes to mature through photosynthesis instead of heat. The result is a perfect paradise to make exceptional wine. All these factors come together in our selection. Syrah supplies the punch and power, and Cabernet provides the complex flavors of chocolate and spice. Spectacular!